The history of the current Palestinian-Israeli conflict is as confusing and conflicted as anything can be. We, today, concentrate on the events that have taken place since the formation of Israel as a nation in 1948. That is a short sighted view, focusing on who threw the first stone in the last 60 years or so. This book, written by Kai Bird, the son of an American Foreign Service Officer who moved his family from Oregon to serve in Jerusalem during the late 1950's, lays bare the roots of the continuing conflict that still ravage the region. This was a very tense time in the history of the area, a time in which Israel took control of the Sinai Peninsula and the Suez Canal. And young Kai Bird had a front row seat to it all. What makes this book so compelling is that is holds no real bias for either side. Rather, the author explores the history and cultures of the region, looking for the reasons behind why these two cultures, who are so close in many of their beliefs, have come to the brink of annihilating one another while the whole world watches. The conclusions drawn by the author may shock you. 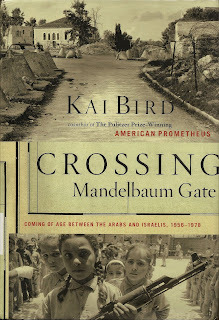 The Mandelbaum House, which had a gate, from which the author took the title of this book, was a house that stood on the very edge of the Northern Wall to the Old City of Jerusalem. It was built by Simchoh and Esther Mandelbaum in the late 1880's, who, having outgrown their house in Jerusalem's Jewish Quarter, decided to build just outside the wall in an effort to attract, and expand, the Jewish Community. At first things were going well, but by the 1920's the house had become an outpost, frequently attacked by the neighboring Arabs. In 1929 the house became the headquarters of the Jewish Haganah. It also became the unofficial dividing line between New and Old Jerusalem. This is the gate through which the author passed daily as a child. The infighting amongst the Saudi families, the wrangling between President Eisenhower and Abba Eban on the eve of the 1956 War, which would pit the United States against the Soviet Union for de-facto control of the region, are all covered in this scholarly and researched work. Jordan's changing role over the years is of special interest, as the Palestinian refugees continue to suffer the hardships of their initial refusal to share Palestine, largely at the urging of her Arab neighbors, such as Jordan and Egypt. The biggest surprise in the book is how the author lived, side by side, with both Israeli and Palestinian citizens, getting to know each side of the story that has come to define the Middle East. This is an engaging and informative book that will help you navigate the intricacies of that conflict.